A rare Daimler E4 limousine, a magnificent Series 1 E-Type and ‘RRG 1’ registration among early entries for Barons’ April 14th Sale at Sandown Park. After more than 60% of the cars entered in Barons’ sale at Sandown Park on February 24th found new owners (see full results below), the auction house is now gearing up for its annual Jaguar Heritage, Classic & Collectors’ Car Sale – also at Sandown Park – on April 14th. There are a number of interesting cars amongst the early entries – and a registration number that could well catch the eye of owners of the new Rolls-Royce Ghost. The ‘RRG 1’ registration number would be just the thing to adorn the latest Rolls-Royce. And, at £25,000-£27,000, it’s a fraction of the cost of the car it would sit on; prices for that particular model begin at just over £200,000! Early Jaguar entries for what is always a hugely popular event include a 1965 Series One E-type that has been extensively restored and upgraded as the result of a nut and bolt restoration. Equipped with five-speed Getrag all synchromesh gearbox, Harvey Bailey front anti-roll bar and electro-hydraulic power steering, this very smart, bright red convertible, carries an estimate of £55,000-£60,000. There are also two very special Daimlers consigned to the sale. 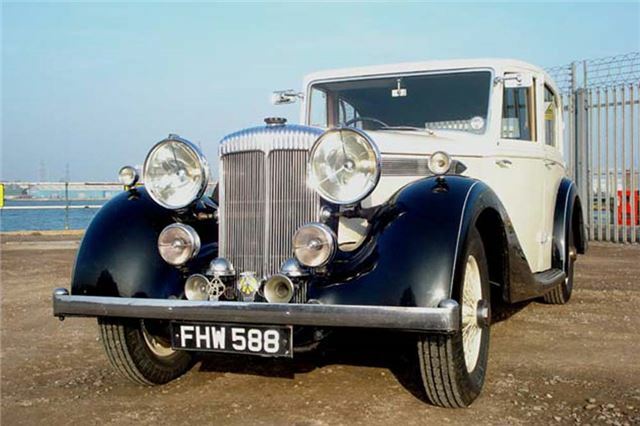 The 1939 Freestone & Webb E4 Straight 8 Limousine is one of just five such cars ever built, and now believed to be the only one left in existence (estimate £33,000-£38,000). And the 1983 Double Six has a fabulous specification, having been completely rebuilt and extensively modified in 2008 by Brian Ball, now a Jaguar specialist and formerly a worker on the Brown’s Lane production line (estimate £15,000-£20,000). In the Classic & Collectors’ Car section of the sale, there’s a 2006 Aston Martin V8 Vantage (£31,000-£35,000). This car was originally consigned to Barons’ February sale, but the vendor held it back, as its replacement – a brand new Aston Martin – didn’t arrive in time. For further information, or to consign a car to the Jaguar Heritage Sale on April 14th, visit www.barons-auctions.com, email info@barons-auctions.com or call 08454 30 60 60.